Thank you to local mom, Jenny Reed for a great fall activity for the whole family! 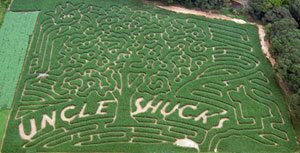 My family and I love visiting a local corn maze near our home in North Georgia every October called Uncle Shuck’s Corn Maze. We found that a weekend in October usually works best for us and we print the $1 off coupon from their website for savings on the tickets ($9 for ages 4 and up). The maze design changes every year and this year’s maze is an apple tree with the sun shining down. Of course you can’t tell that when you are winding your way through the 4 miles of maze! Kids find it fun as they navigate using the maze map and find the checkpoints to mark on their maps. Our friends and family love to see who can finish first as well! Other activities at the maze include hayrides, a pumpkin patch, corn cannons and a mini haystack maze for children. In October they even offer a Haunted Maze as well! With the crisp Fall air and the beautiful North Georgia mountains in the background, an afternoon at Uncle Shucks’ is fun for my whole family!